The demand for Teslas is dropping like flies, Carlos Ghosn has been arrested again, and Boeing is still making the 737 Max despite it being grounded after two crashes. All this and more in The Morning Shift for Thursday, April 4, 2019. Remember Bloomberg’s algorithm that predicted enormous production rates for Tesla that peaked beyond what Tesla itself thought possible? Yeah. Turns out that they miiiight have gotten a little ambitious with that one. Tesla Model 3 deliveries actually fell during the first quarter. That isn’t to say that nobody is buying Teslas—instead, Tesla had more orders than they could actually fulfill. The company delivered 63,000 vehicles in the three months that ended in March, according to a statement Wednesday, down from 90,966 in the fourth quarter. Tesla fell as much as 8.5 percent during U.S. pre-market hours. In the U.S., where Tesla introduced the Model 3 sedan in 2017, tax incentives for its vehicles shrank. In Europe and China, the company struggled to quickly get the cars to consumers. The 50,900 Model 3 Tesla delivered in the first quarter missed analysts’ average estimate for 51,750 and was less than in the two previous quarters. The shortfall is a setback for Chief Executive Officer Elon Musk’s plan to accelerate sales with lower prices and target more markets worldwide. 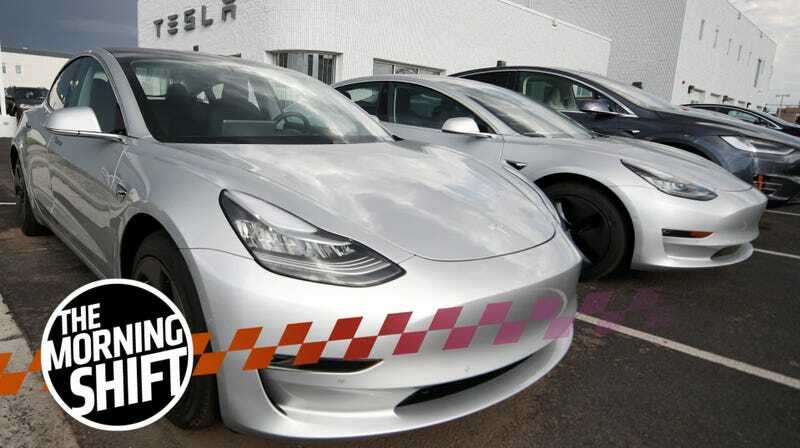 A significant factor in the fall of domestic delivery might just be due to the Tesla Model 3's entry into new markets in China and Europe, which present their own logistical challenges and mean Tesla wasn’t quite so focused on getting as many cars out as possible, as opposed to introducing new cars to new markets. There are a ton of new factors playing into Tesla’s ordeal, too. As Bloomberg points out, “shares have slumped 12 percent this year amid demand concerns, multiple price cuts, job reductions and a continued exodus of senior executives.” The inability to meet delivery demand after Elon Musk’s ambitious projections thus comes across as another dark mark on Tesla’s record. Update 4/4/19 12:22 PM: We’ve updated this section to further clarify the distinction between Tesla’s orders and their deliveries. Tesla says that it’s all because it received more orders than it could fulfill, though it’s still a bit of a complicated story. 2nd Gear: Carlos Ghosn Arrested—Yes, Again. Just when you think the Carlos Ghosn scandal can’t get any wilder—just when his name falls out of the news cycle and you let yourself relax—something else drops into your lap. The Ghosn news hasn’t stopped flowing since last night; here’s everything you need to know. Prosecutors arrested Ghosn following an early morning raid at his Tokyo residence Thursday, escalating the legal jeopardy facing the former chairman of the Renault, Nissan, Mitsubishi alliance. In their public filing, prosecutors said they arrested Ghosn on breach of trust suspicions for allegedly causing some $5 million in damages to Nissan from December 2015 through July, while Ghosn was CEO and chairman of the Japanese automaker. Ghosn’s lawyer is calling this a “hostage situation” because, he claimed, Ghosn had already been released on bail and thus shouldn’t be re-arrested—the new charges, he said in a press conference, are intended to increase pressure on Ghosn and basically get rid of all evidence Ghosn could use in his defense as he gets ready for trial. This arrest comes after an odd tweet that was purportedly by Ghosn (or someone on his behalf) claiming that there would be a press conference revealing the “truth” on April 11. And, according to an unhinged tweet from Fox Business anchor Maria Bartiromo, Ghosn was arrested while she was preparing to speak to him in an exclusive interview. Please note that police arresting executives charged with white collar crimes is not traditionally considered “criminal,” but Bartiromo knows who butters her bread. Ghosn left the Renault board on Wednesday, as per Automotive News Europe, replaced by former head of Daimler’s Smart brand Annette Winkler. This decision was prompted by Renault’s internal probe into Ghosn’s business practices, which they determined to be “questionable and concealed”—evidence it used to then block Ghosn’s pension. In fact, not only is Boeing still making the grounded planes—it’s pushing harder to keep producing them. Why bother? Subcontractors have even begun to speed up the manufacturing pace for the 600,000 parts that go into each one of the single-aisle workhorses, Boeing’s largest source of profit. So, basically, Boeing is erring on the side of optimism. Its decision implies that not only is the company is confident that the problem with the planes can be resolved before the PR gets too bad, but so are its customers. [Boeing] could postpone the rate increase and perhaps freeze share repurchases to preserve working capital. If the grounding extends late into the year, the company could slow work at its 737 factory in Renton, Washington, as it did twice following the Sept. 11 terrorist attacks. Looks like Boeing is firmly stuck between a rock and a hard place with this one. Not really, just kidding. Boeing will be fine. Can’t say as much for the passengers on those two planes, though. While we’ve known for a while that Brexit’s impact on the car industry would never be good, we’re starting to see just how dire the situation actually is in the form of falling car sales. In fact, the UK has just seen its lowest March sales numbers since 2013. Car sales dropped 3.4 percent year-on-year to 458,054 passenger vehicles as consumers stayed away from showrooms during what’s usually a strong month for new purchases because of a number plate changeover, the Society of Motor Manufacturers and Traders said. If you’re curious about exactly how Brexit could impact the UK car industry in the future, the European Automobile Manufacturers Association has put together a great fact sheet that transforms this data into some bite-size numbers. The verdict is that everything will be bad, always. About one of every seven new-vehicle buyers obtained financing last month with interest rates commonly associated with the used-vehicle market as automakers continued to scale back incentives, Edmunds said Tuesday. Fourteen percent of borrowers who bought a new vehicle last month will pay interest rates higher than 10 percent, according to Edmunds, the highest levels since February 2008. Fewer customers are receiving lower interest rates in general, according to [executive director of industry analysis Jessica] Caldwell. With no-interest deals drying up, customers are also seeing fewer deals between 0.1 and 3.99 percent. Though economic uncertainty usually spurs incentive activity, analytics company ALG expects automakers to continue decreasing incentives as the year progresses. ALG said in a statement last week that average incentive spending would reach an estimated $3,604 per vehicle, down 5 percent — or $191 — from a year ago. With economic uncertainty on the rise as a result of US-Mexico border relations, US-China trade relations, and Brexit on the horizon, this just doesn’t look like a particularly good time to be buying a brand new car. Bill France Jr., the leading force behind the transformation of the National Association of Stock Car Auto Racing (NASCAR) from a regional sport into a multibillion-dollar industry with fans worldwide, is born on this day in 1933 in Washington, D.C. France’s father, William France Sr. (1909-92), founded NASCAR in 1948. Neutral: Is Tesla Just Not Cool Anymore? Remember when Tesla was still a new, hot brand in the car industry, when Elon Musk was the hip and cool savior of the car industry, when the concept of the electric car was still pretty niche? A lot has changed since Tesla Roadster—is Tesla still “cool”?